The South Bay Union School District's move to adopt Technology is Big Winner for both Parents and Students! Parents will now be able to access an "App" that will tell them when their child boards a school bus and where and when they get off the bus! They will also be able to get notifications by email or text. This can be done with an app called "Here Comes the Bus" that they can download on their Smartphone or Tablet for free. In families that have both parents working this has to an early Christmas present for them. 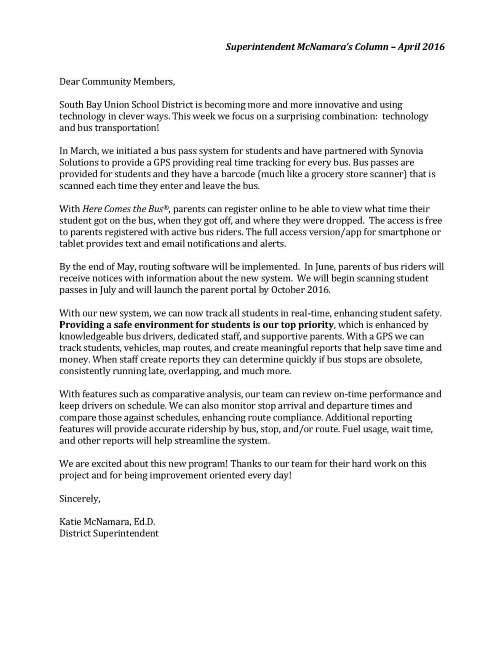 I applaud the South Bay Union School District for putting this in place for parents and their forward thinking in using today's technology advances to help provide more safety for our children. Having been a parent and now a grandfather of two, knowing that my child has made it home or made it to were they are supposed to be provides a great deal of peace of mind and if they are not when they are supposed to be that action can be taken quickly to rectify that situation. Here are the details from Superintendent Dr McNamara's April Newsletter that we published earlier this month. For those of you who are not aware, we publish a newsletter from Dr McNamara every month. We have also included below links to all of Superintendent Dr McNamara's Newsletters and links to all of the South Bay Union School District's Press Releases and Community Updates. SBUSD Superintendent, Dr. Katie McNamara, begins her “Monthly Column Series” to keep the Local Community informed of Events in their Schools!